You are on a low or no income. You have no assets. Nobody owes you money. You have no relatives or friends or those you have are in the best of health or financially as bad or worse off than you so there is no prospect of inheriting from them should they imminently expire. And you owe council tax. The council can't bring bankruptcy proceedings against you unless the debt is for at least £5,000. No creditor can: the £750 limit has been raised. But say you do owe £5,000 or more? The debtor in Lock v Aylesbury District Council Ch Judge Hodge QC 9 July 2018 owed £8,067. She was living in social housing and dependent on financial support from her daughter. There was no satisfactory evidence that she had any present or prospective assets that could be realised if she was made bankrupt and there was nothing to indicate that any investigation of her affairs by the Official Receiver would bring anything to light. The bankruptcy order which had been made against her was quashed. It was pointless. The judge ruled that where a bankruptcy petition was based on unpaid council tax, there was a burden on the council to show that, on the face of it, a bankruptcy would achieve some useful purpose. There is no reason why a 'pointless' argument should not be advanced by a debtor in respect of some other kind of debt in an attempt to avoid bankruptcy. For much, much more on bankruptcy, see my book Breaking Law. It won't bankrupt you! Divorce on 'Unreasonable Behaviour'. Post-Owens, Where Are We? But what does it all mean? Sooner or later the divorce laws will almost certainly be changed by Parliament to make it clear that blame will not directly or indirectly feature in the divorce grounds. For the time being, it will only be in a toeful of cases each year that the Owens case will have any impact. Other cases will sail through as undefended and almost all of the defended cases will lead to a divorce being granted. Where there might potentially be a problem (as in the Owens case) is with a divorce petition which is based on what we call 'unreasonable behaviour' with the other party defending on the basis that they did not do what has been alleged against them or that what they did was not 'unreasonable behaviour'. What the Supreme Court stressed is that 'unreasonable behaviour' is a misdescription of the divorce ground. What has to be unreasonable is not the other party's behaviour but the expectation that the petitioner should have to continue living with them. And while the court has to be satisfied that the marriage (or civil partnership) has irretrievably broken down it matters not that such breakdown is attributable to some factor other than the other party' s behaviour. One of the problems in the Owens case is that the judge at the original hearing when the wife was refused a divorce heard only a few of the wife's 27 allegations about the husband's conduct. Just one day had been allocated to the hearing. The wife had suggested a half day and the husband three days. The lesson to be learnt from the case is that where the other party is defending a 'behaviour' petition then the petitioner should not be economical in the number of allegations they are making and should ensure that the court allows enough time for a sufficient number of those allegations to be ventilated. The petitioner can start off with fewer allegations but add to them later if the other party resists the divorce petition. Making too many allegations at the start can provoke contention that might otherwise have been avoided. An amended Practice Direction for insolvency cases came into force on 4 July 2018. It widens the jurisdiction of county court hearing centres which can deal with insolvency work. But only just. Ordinarily staying put at one of these centres will be opposed and unopposed applications to set aside a statutory demand; unopposed company winding up and bankruptcy petitions; applications for income payment orders; public and private examinations; possession claims and claims under the Trusts of Land etc Act 1996;; charging order applications and their enforcement in insolvency cases; applications for debt relief orders; and a few other bits and pieces. Note that opposed bankruptcy petitions will have to be transferred out. So who gets the business that cannot be retained by these hearing centres? On the South Eastern circuit it will be the County Court at Central London. Elsewhere it will be a hearing centre located at a Business and Property Court on the same circuit or one of the specialist centres on the same circuit. Those specialist centres are currently at Brighton, Croydon, Medway, Preston and Romford. When the case is transferred out a specialist judge at the transferee court is to take a look at the papers as soon as possible and decide where the case can most fairly be decided. The written representations on this from the judge who transferred and from the parties are to be taken into account. The case could even be sent back from whence it came! The danger is that debtors against whom bankruptcy proceedings have been brought will more readily lodge their opposition to the proceedings and thereby earn perhaps a couple of months of valuable time while the case finds its resting place during which they will hope to gather together another money to pay off the creditor. We shall see. Not quite winning the lottery but you might just be in for a few bob you weren't expecting by way of a refund for overcharged court fees. First, a warning. None of the fees overcharged relate to what had to be paid to the court on starting a case or close to the trial in the form of the hearing fee. Here are the fees in question. The county court fee for a stage 3 low value personal injury pre-action protocol claim. In most cases that has been overcharged by £103. That's because the fee called for has been a 'sweep up' fee of £308 rather than a fee based on the amount being claimed.The other fees concerned were worked out on a duff basis and will be reduced as from next Monday 23 July 2018 under the Court of Protection, Civil Proceedings and Magistrates' Courts Fees (Amendment ) Order 2018 SI/2018/812. In the Court of Protection fees are down for making an application or lodging an appeal from £400 to £385 and £320 respectively. In insolvency proceedings, an application on notice to the other parties in existing proceedings will cost £95 instead of £155 and an application without notice or by consent in existing proceedings comes down from £50 to £25. There are also reductions in Commercial Court and Technology and Construction Court arbitration fees and in eight magistrates' courts' fees. If you have paid any of the fees at the higher rates mentioned whether when acting for yourself or through your solicitor or barrister or even possibly when settling the costs of your winning opponent which have reflected the higher rate, then watch out for an announcement by the Ministry of Justice about how you can claim a refund. And I will keep you in the know in this blog. Your landlord is likely to tell you that it is too risky for you to challenge service charges because, if you lose, it will cost yer! Where your lease says, in effect, that they can bill you for what amounts to an administration charge to cover their costs of successfully defending a service charge challenge then that could turn out expensive for you. I have to tell you that this could happen. And it is not widely appreciated that as a result of a 2015 Court of Appeal decision you could still be saddled with having to pay these costs (subject to the reasonableness of their amount) even where the claim is decided as a 'small claim' in the county court. The usual restrictions on the costs which the winner can recover will not apply. However, what you can now do as a result of a law change on 6 April 2017 is to apply to the county court under schedule 11 paragraph 5A of the Commonhold and Leasehold Reform Act 2002 (phew!) for an order which would wipe out or reduce your liability for the administration charges covering these costs before the case is heard. You would succeed on such an application if the court thought it was 'just and equitable' for you to do so. The more outrageous the wording of the lease, the better your chances. If you want to make a schedule 11 application (see above) then it would be wise to issue not only an application for this in the county court which would catch the landlord's administration charges for the work done in the county court but a separate application to the tribunal to catch the work done in the tribunal ( and the standard tribunal application form for service charge challenges already makes provision for an additional application under schedule 11). The tribunal judge can deal with the landlord's county court costs but they must not involve any other non-lawyer member of the tribunal in their decision on this because they would not have jurisdiction to poke their noses in. If there has been a nose-poking which led to an adverse decision against you then you may have a ground to appeal it. If the administration charges are decided against you but without having been previously demanded of you by the landlord then the probability is that the landlord would not have yet become entitled to receive them and any court or tribunal order for their payment would be bad and appealable. A bit more law for you on how HMRC tax penalties may be overcome. And if you like what you read then grab http://www.breakinglaw.co.uk/2018/06/tax-penalties-may-be-unlawful-latest.html and you might just want to buy my book at the same time so that I can afford to pay my tax bill due at the end of this month). You thought that ignorance of the law was no defence, didn't you? Well it sort of might be when we come to whether you have a reasonable excuse for not paying tax penalties. That was made clear by the Upper Tribunal of the Tax and Chancery Chamber (it wasn't my idea to call them that!) in Perrin v Commissioners for HMRC  UKUT 156 (TC). If the excuse was objectively reasonable then it might lead to penalties being quashed. The Tribunal said that some requirements of the law were well-known, simple and straightforward but others were less so. It would be a matter of judgment for tax tribunals in each case whether it was objectively reasonable for a particular taxpayer to have been ignorant of the requirement in question and for how long. HMRC was also condemned for its habit of putting forward arguments that an excuse had to be based on some unforeseeable or inescapable event or an unexpected or unusual event. That was not the law. In future cases where these arguments were trotted out, HMRC might be ordered to pay the costs of a taxpayer who had successfully appealed against penalties. 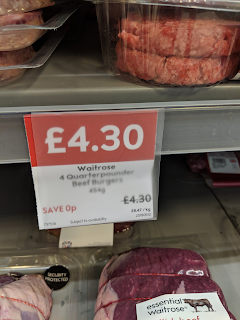 Long suffering followers of this blog are painfully aware that I can be reduced to tears by false price labelling in shops and by the inadequacies of the Waitrose car park in Richmond-upon-Thames. But I was confident that when I popped into the Waitrose branch at Havant, Hants the other weekend, I would emerge with dry eyes. It was not to be. A price label by the displayed bottles of Volvic water proclaimed that they were ‘Two for £1.’ But at the checkout I was charged 67 pence for each of eight bottles. Holding back the vapours, I queried the overcharge. An urgent investigation was initiated. It transpired that the offer had expired and the price label had wrongly remained in position. I was immediately credited with the overcharge. How many customers had happily overpaid, we do not know. The staff dealt with the matter in a correct and efficient manner but this should not have happened. As I explain in my book Breaking Law, it is an offence for a trader to mislead a customer about the price of a product. The trader will only have a defence if it can show that it made a mistake, the offence was due to an accident or another cause beyond its control and also that it took all reasonable precautions and exercised all due diligence to avoid an offence. Not easy to show all that. And if you have actually paid over too much money because you were misled over price then there are some lovely civil remedies available to you which I cover in the book (yes, that book again). I took up what was the car park enigma by e-mail. Here's the exchange. I am intrigued. The entrance barrier at your Havant store car park is down (and so a ticket has to be withdrawn from the machine at the barrier in order to raise the barrier) but the exit barrier remains up and no charge is levied upon or prior to exit. What is the point of keeping the entrance barrier down and what a waste of redundant car park tickets? Also, the car park booth appears to be very sick in that it is covered in bandages or such like as if waiting to be transported to hospital or auditioning for the Doctor Who tardis understudy? Thanks for getting in touch with your queries about the car park at our Havant shop, Stephen. This does sound like quite the mystery so I'd like to thank you for bringing this to our attention. I've had a chat with the shop today and they've let me know that when the car park entrance barrier is down but the exit barrier is up, this is done to deter those who aren't shopping with us from using the car park. Unfortunately there are occasions when both barriers are up that people will take advantage of the car park due to its location, which then means that people wanting to shop with us aren't able to find a space. The shop have found that by having the entrance barrier down only those who are wanting to shop with us use the car park. With regards to the booth's apparent audition as a Tardis understudy, the shop have let me know that unfortunately it's seen better days due to people driving in to it. The shop have reported this to the relevant team but don't yet have a finalised date for when the repairs are going to be completed. Please however rest assured that they're aware of this and have taken the necessary steps to get this sorted. Thanks again for taking the time to contact us about this and for giving me the chance to look into this for you. If you have any other queries or concerns please don't hesitate to contact us again. We're passionate about continually improving the service we offer our customers. If you'd like to feed back on the service I've given you, please click on the link below (omitted) to take part in our quick survey. As a thank you, we’ll also enter you into our monthly prize draw where you could win £500 in gift cards. I'm not convinced that anyone would be fooled into believing they might have to pay for parking when they can see the exit barrier up as they enter. But then I haven't been on a Waitrose training course. Oh and just one other thing. This was the price ticket displayed at the Wimbledon branch of Waitrose the other day. Pretty enticing, eh?